Serie Architects has unveiled a low-lying design for the Jameel Arts Centre in Dubai, which does not "rely on exuberance to make a statement". Made up of two clusters of white aluminium boxes and located on a small manmade island at the tip of Jaddaf Waterfront on the Dubai Creek, the Jameel Arts Centre is designed to be deliberately understated and "not very Dubai". The building is the centre piece of a wider mixed-use development owned by global investment company Dubai Holding and is Serie Architects' first built project in the Middle East. It spans 10,000 square metres and is one of the first independent not-for-profit contemporary arts institutions in the city. "Everybody says that this arts centre is very 'un-Dubai'," said Lee. "It's precisely so as, in a sense, we didn't want it to be very 'Dubai'. It's a very understated building because we wanted it to be almost like a backdrop for the art." "It doesn't rely on exuberance to make a statement," he continues. "Instead there is a great commitment to investing in the local culture and community. It is using culture as a transformative power in a city like Dubai." Surrounded by water, the centre's layout is based on local Sha'abi houses which were built in the Gulf in the 1970s and 1980s. Built mostly in concrete, the Sha'abi houses were single-storey homes composed of a series of rooms overlooking communal square courtyards designed to strengthen community spirit. 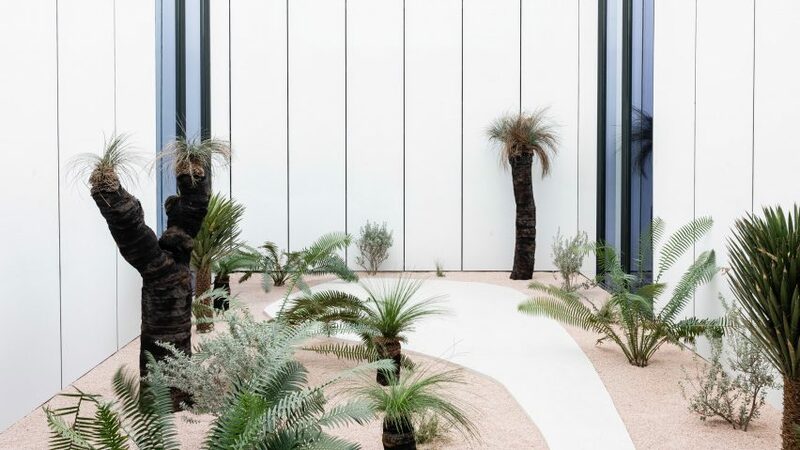 Similarly, the two clusters of aluminium-clad boxes that make up the arts centre are built around a series of seven courtyard gardens that have been planted with local desert vegetation by landscape architect Anouk Vogel. These spaces are intended to encourage visitors to pause for conversation and reflection during their visit. The two clusters have distinct functional identities; one is made up of ten galleries while the other houses a library, conference room and a dining pavilion on the ground floor, offices on the first floor, and artists studios on the second. A single story concrete colonnade wraps around the entire site providing shade and places to sit without blocking the views. The architect describes it as an open framework that makes the building more inclusive by encouraging activity around the site. "Art galleries are usually housed in contained boxes that are very closed to their environment, but here the ground floor is made intentionally porous," Serie Architects founder Chris Lee told Dezeen. On the building's south side, a sculpture park designed by Dubai-based ibda design sits between the centre and the waterfront. For the opening week the park plays host to a large scale light installation by Studio Roosegaarde called Waterlicht. Series Architects took care to intersperse each of the ten galleries with a desert garden courtyard and a view out into the surrounding landscape. "As you move through the building you are always in touch with the exterior space," Lee explained. "Every gallery is always clustered around a courtyard so you'll always experience art alongside nature and alongside landscape. It's designed this way to alleviate what we call 'exhibition fatigue'." The garden courtyards – created by Anouk Vogel, who also designed the Bahrain pavilion for Milan Expo 2015 – are treated by the arts centre as artworks in themselves. Desert plants are arranged around curving pathways lined with pale pink gravel. "I treated these spaces almost like canvases. The choice of plants is in each garden is inspired by the world's biggest deserts. Then all of these plants come together in the main entrance courtyard," Vogel told Dezeen. "Some plants have been rescued and transplanted from construction sites across the world where they would have been destroyed. Some are up to 300 years old." Jameel Arts Centre's director, Antonia Carver, gave Lee and his team considered feedback throughout the process advising on everything from choice of material to layout. "We asked ourselves how the public would use these galleries and how we could make their lives easier, and also looked at the needs of our artists," Carver told Dezeen. "We wanted really flexible space that was based on a Kunsthalle model of an arts centre rather than a museum," she continued. "We have an exhibition model that means there is something new for visitors to see every two weeks but at the same time we have a space that combines architecture and gardens that allow you space to pause, reset your mind and rethink." The galleries on each of the building's three floors have a circular layout so that visitors can loop around the space before ascending the central staircase to the next floor. Temporary, fast-moving exhibition's are located in the ground floor galleries, while six-month-long shows and large-scale sculptures are displayed on the first floor. The second floor houses larger installations and video work. "Flexibility is key to the design," said Lee, who references the Dulwich Picture Gallery as a source of inspiration. "Each and every gallery has a different proportion and different height. As you move up through the floors the ceiling heights begin to rise and the galleries get larger and larger." The Jameel Arts Centre's position on the waterfront means that it is visible from every side with no rear elevation. "This poses a very difficult problem because you can't hide anything," explained Lee. "Ordinarily you can hide all of the MEP [Mechanical, electrical and plumbing] at the back of the building but in this case, we had to put it on the south side, which is the least precious elevation." When visitors approach the building from the road on the south side, the building has been skewed so that they see the sculpture park first drawing the eye towards the entrance. The building is entered around the gift shop and through an entrance courtyard before arriving in the lobby where floor-to-ceiling windows frame the view out across the creek to the north and sculpture park to the south. The open-access research centre and library are located to the east while the galleries are to the west. An outdoor staircase off the north colonnade leads to a roof terrace designed for film screenings and events. Photography is by Mohamed Somji unless stated otherwise.